Gary Patterson who is the vice president and leads the sales and customer service operations at Shelby American, has released a few details about what we can expect to see next year. Patterson says there will be “lots of new things” coming out of Shelby in 2013. One of the first things he mentions is a new wide body option on the 2013 Shelby GT500 Super Snake, that will be unveiled at the Detroit Auto Show next month. Shelby will be involved in “a lot of shows and events coming in 2013,” and it looks like Shelby American will have more new things to show us. 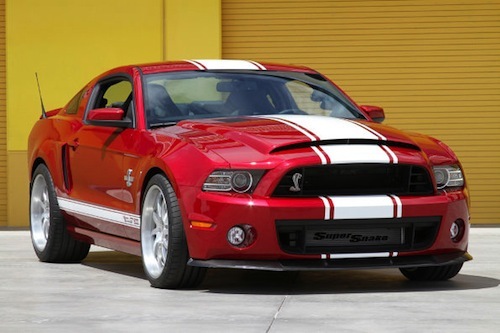 The 2013 Shelby GT500 Super Snake wide body option will enable buyers to put much larger tires on the supercar allowing a 345 or 355 wide tire on the rear of the powerful snake. They will also be offering a wide body option for the 2005-2009 Mustangs which would include the Super Snake and Mustang GT models. Owners will be able to take their cars to Shelby American and they will install the new wide body option at their facility in Las Vegas. Patterson also tells us that in 2013, “the GTS which is available with a V6 or a V8 you can get for ten or twelve thousand dollars you can have yourself a serial numbered Shelby and then you can build it up over time. The GTS is a lot of people’s first Shelby and we take an extreme amount of pride in that vehicle.” He goes on to say, “And of course, we still have the GT350, the rock star of the racetrack which you can purchase in all factory colors in both coupe and convertible configurations." That quote from Carroll Shelby says, “I think you're going to see the industry going completely to small engines with turbochargers. That's the only way you can get the mileage that the government is going to be demanding.” According to Mustangs Daily, they think that it could mean we will see Shelby cars with a smaller EcoBoost engine for the first time. Ford has had great success with the turbocharged EcoBoost engines and have won numerous awards recently. Ford continues to develop new small EcoBoost technology and they are producing some amazing results. A good example of what Ford has been able to achieve is to take a look at Ford’s award winning 1.0-liter EcoBoost engine. The engine scored one of the fastest lap times ever at Germany’s famed Nurburgring Nordschleife circuit in a Formula Ford race car. The one-off single-seat racer completed the lap in 7 minutes, 22 seconds to register the 11th fastest time ever on the circuit. No other three or four-cylinder car has posted a faster time at the legendary circuit. It gets even more impressive when it’s compared to the list of supercars that it was able to beat. The incredible time puts it ahead of the 700 horsepower Lamborghini Aventador, 660 hp Ferrari Enzo and 602 hp Pagani Zonda. The 1.0-liter EcoBoost-powered Formula Ford boasts an unofficial top speed of 158.8 mph and a 0-62 mph time of less than four seconds. If Ford can get that kind of performance out of a 1.0-liter engine, just imagine what they have done with a larger displacement four or six-cylinder EcoBoost powerplant. Ford may have already developed a powerful new four or six-cylinder turbocharged EcoBoost engine to power the new Shelby GT500 Super Snake's of the future. Stay tuned.